For the 1977 season, I was lucky enough to get a job as a ride operator at Belle Vue Amusement Park. I drove the trains on the Steam Railway and I also worked on other rides such as the Jetstream, Ghost Train, and Magic Cavern. Occasionally I found myself in the rafters of the King’s Hall operating the spotlights for a concert. As well as the Steam Railway one of my other interests was the Scenic Railway. 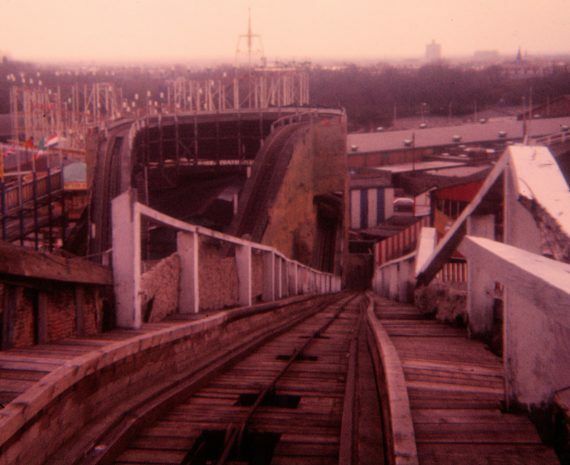 Belle Vue had been the home of a few wooden roller coasters but the only one still there in 1977 was the Scenic Railway. 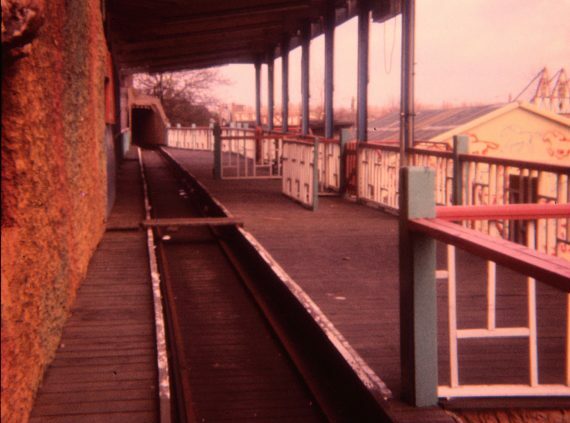 This ride sadly saw its last paying passenger in 1976 when the ride was closed for some minor repair to the track. 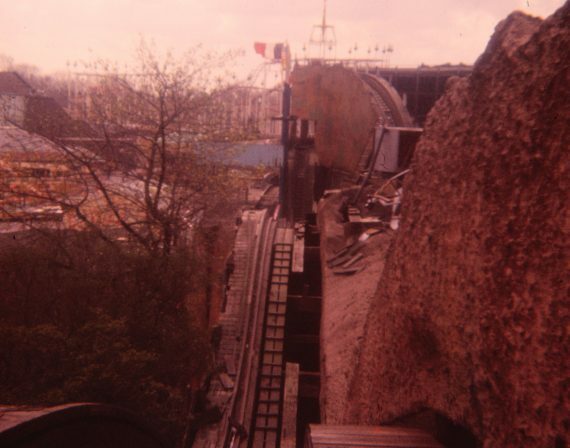 The repairs were not carried out due to cost and the ride did not operate again. The ‘Scenic’ as it was called affectionately by the park staff, arrived at Belle Vue around 1927 from the British Empire Exhibition in Wembley, London which had closed in 1925. 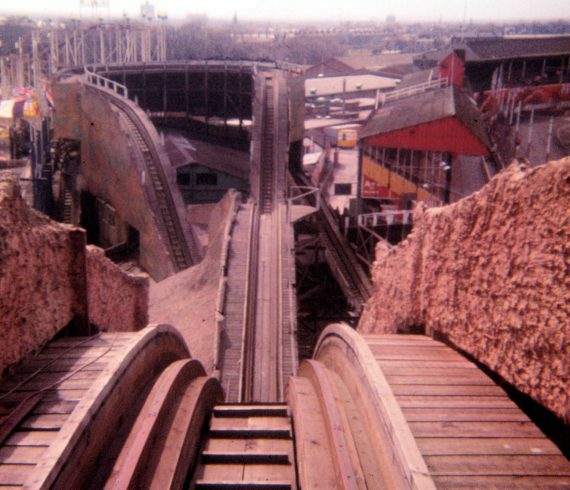 I remember a lot of the older staff spoke fondly of this ride as it was all hands on. There were four trains each of which consisted of 2 cars riding on three ‘bogies’. These two cars were joined together on the middle ‘bogie’ where there was a seat for the brakes person and a large lever which applied the brakes when pulled. This was the only means of controlling the train on its entire journey around the track. As I was ‘staff’ I could go almost anywhere if I let someone know where I was. Health and Safety was different then, so I could explore the Scenic Railway track and workshop as I wished. 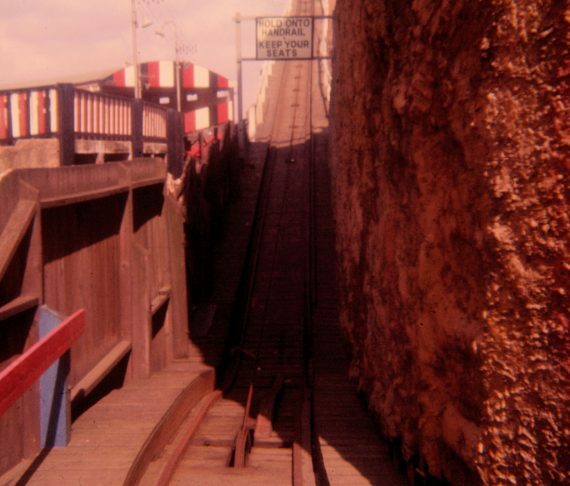 The station had a wooden platform and the ride started when the brake person released the brake and the train gently rolled round to the ‘pull-up’ (or ‘lift hill’ in the USA) on the other side of the ride. At the bottom of the ‘pull-up’, the cars attached themselves automatically to a moving cable and when the train reached the top the cable released, and the train was then just under the control of the brake person. The train then made a 180-degree turn and then down the 1st drop. This was different from other roller coasters as the 1st drop here was a switchback. The train then went around another 180-degree bend to the 1st drop proper. The track then dropped to just above the ground where the train reached its top speed and then the track rose again before another return bend. This took the train to another switchback and this was where the repair was still waiting to be carried out. The train went around another 180-degree bend, another switchback and then through a tunnel before arriving back in the station. Just before it arrived at the station it passed a small siding which led to the car shed and workshop. This shed was quite substantial as it had to house 4 two-car trains and adequate workshop facilities. There was an idea at the time to increase the capacity of the Steam Railway by using the old Scenic Railway cars mounted on spare Steam Railway ‘bogies’ as one of the pictures shows. The Steam Railway would be able to run two trains in busy periods but due to impending closure, this idea was not pursued. 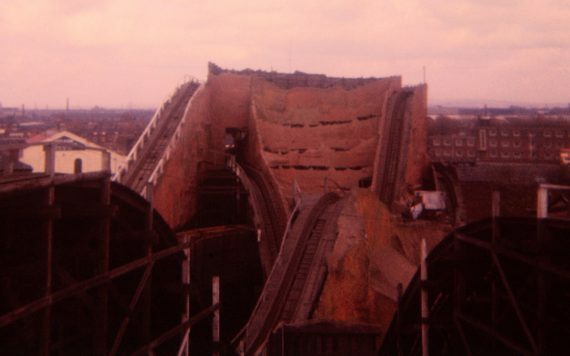 In January 1978 a local construction company demolished the Scenic Railway. 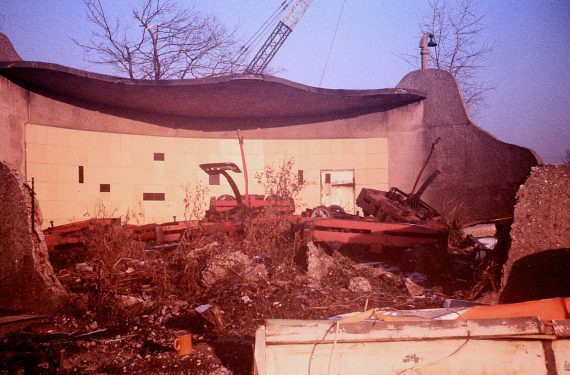 These pictures show the demolition in progress. 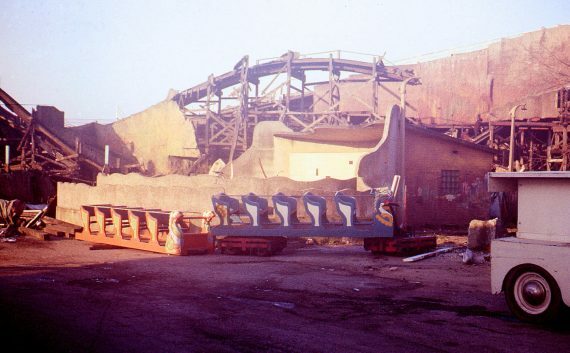 The trains were dumped on the ground in front of the ride and some of the ‘bogies’ were left in what remained of the ‘Monkeyrama’ display. 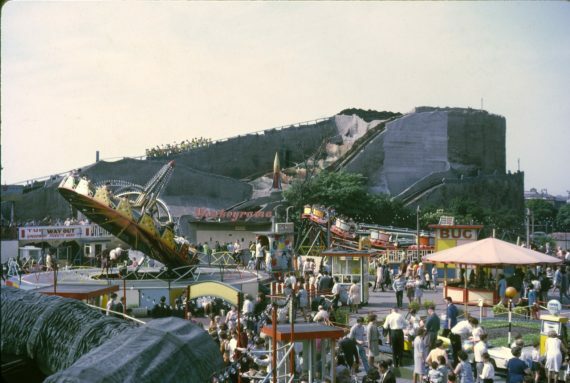 Apart from photographs and memories there is very little left to remind us of this fantastic ride which entertained visitors at Belle Vue for nearly 50 years. I believe at least one of the distinctive ‘horses heads’ which embellished the front of the trains was rescued before the demolition. These are like those on the trains that still run on the Scenic Railways at Dreamland in Margate, Kent and Luna Park in Melbourne, Australia. Interestingly, even though the ride was closed, quite a few staff who were not working on a Saturday evening would congregate at the top of the ‘pull up’ for a grandstand view of the Belle Vue Aces performing in the speedway stadium below. 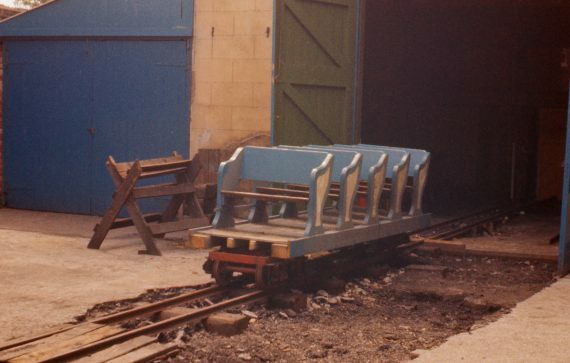 I still regret not working at Belle Vue when the Scenic Railway was operating as I may have had the chance to work on this exciting ride myself. 1960, Saturday night out, first a visit to the speedway followed by free entry into the fairground. We had very little to spend but my favourite was a ride on the scenic railway. We hoped there wasn’t a long queue because as 15 year old girls we had to be sure of getting our bus home in time for our 10-30pm curfew. Such happy memories and how times change. Thanks, Delya! Glad the post brought back some happy memories – we’re hoping to do some more before too long.